Star Retailers comprises seven independent Spar supermarkets in the greater Durban area. Founded in 2008, with the opening of their first store, Starwood SuperSpar in Phoenix, the group has grown dramatically over the past 10 years. Turnover has increased by a remarkable 1500% over this time, and Star Retailers is recognised by both their customers and the Spar Group as a success story. Ravi and Serena Jagadasan had limited retail experience when they decided to open their first store, and elected to take advantage of the expertise available in a big group and bought a Spar franchise. They surrounded themselves with a team of staff with the right attitude to deliver world class service, and have always relied on extensive training to inculcate the skills to support this. Since Star Retailers opened their first store, the group has grown to seven stores, located within a 30km radius with a staff of more than 1000 employees. Their second store was opened in 2011, in Waterloo near Phoenix, and after this, they expanded rapidly, with another store in 2014 in New Germany, two more in 2015 and one each in 2016 and 2017. The group now comprises four SuperSpars (Starwood, Waterloo, Seapoint in Durban Central and Chatsworth, their newest store) and three Spar stores (Golden Gate in Verulam, Chelsea Spar in New Germany and St Georges Spar in Durban Central). Unsurprisingly, Starwood SuperSpar is particularly special to the Jagadasans, as it was their first store, and it is where they began their retail journey, and while Starwood is the oldest store, it is doesn't look it! The store has been extended and revamped three times since its opening ten years ago, growing from 1300m2, to 2000m2. The Jagadasans attribute their success to the groups' culture and the strategy which has been implemented. The group's name is Star Retailers and they use the STAR acronym to describe their philosophy: Success, Team, Attitude and Respect. For Star Retailers, success is achieved with a team of staff that respect one another. 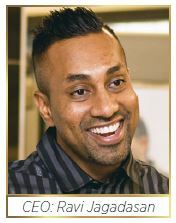 The Mr. Spar Award is the most prestigious award for a Spar retailer, and in his typically humble style, Ravi points out that the award was won not only by him, but by his team who have been loyal to him and have shared his vision and strategy throughout the years. Ravi's team is very close and it is through teamwork and respect that he has achieved such success. He is very hands-on, and believes in leading by example on a daily basis. He has a passion for store design and new innovations and has personally been involved in the design of each of his stores. Ravi is also currently introducing new strategies to ensure that his stores are eco-friendly, with solar power, LED lighting and advanced refrigeration cooling systems to reduce the carbon footprint and consumption of power. He is also considering vertical integration in the stores and introducing his own branding. Star Retailers has a strong commitment to staff upliftment through in-house training in addition to the standard Spar training, and employs three full-time accredited facilitators. Ravi views his role as to empower senior management to achieve the goals of the organisation, and to impart his vision to his management, and the business is based on relationships of respect, honesty, trust and accountability. Sound financial principles mean the business runs on positive cash flow and is virtually debt-free, and sophisticated IT systems integrate the tills, stock and accounting systems for accurate daily financial reporting. The business sources fresh produce from organic farms, and office systems have minimised paper utilisation with electronic reporting, automated reconciliations and all cardboard and plastic packaging is recycled. Community involvement has priority from day one, and giving back and helping the less fortunate is something that is very close to Ravi and Serena's hearts. Star Retailers assists multiple feeding schemes and outreach programmes including community centres, schools, rural ethnic festivals and temples. Each store has a charitable donation budget and staff and management activity visit the programmes for the underprivileged that they support.